Price includes a printed copy of the Field Trip Guidebook, Sunday Lunch and snacks. Pay online after registering via credit card, OR pay with Cash or Check on the day of the field trip. Price includes Sunday Lunch and snacks. Price includes a printed copy of the Field Trip Guidebook and Sunday Lunch and snacks. General Information - This fall’s AGS field trip is an overnight excursion to northwestern Arizona including a stay at one of the many motels in Kingman in Mohave County. 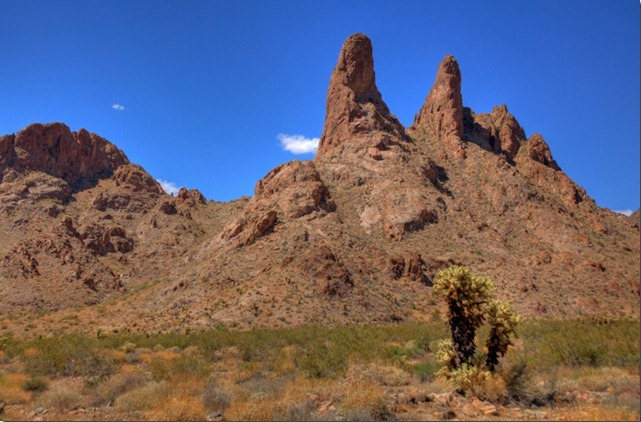 The “formal” trip will start at noon on Saturday, October 22nd in Kingman and end at ~2pm on Sunday October 23rd in the Black Mountains a few miles west of Oatman. Bracketing the formal trip will be additional stops starting early (7am) on Saturday, October 22nd and ending on Monday afternoon, October 24th. This part of the trip will require 4WD vehicles, and for those who want to continue through Monday, a campsite in the Sacramento Mountains, California about 15 miles southwest of Needles will be used. For Monday night, participants will be asked to provide their own camping equipment, or stay at a motel in Needles that will require them to make a 45-minute drive in the early morning in order to link up with the camping crew. Where and When - Early bird portion of the field trip begins at 7AM Saturday, October 22, 2016. The exact coordinates for the early bird meeting place are 35 degrees 8' 45" North, 114 degrees 6' 45" West. This portion of the field trip will require 4-wheel drive vehicles. The first stop of the formal portion of the field trip will begin at noon on Saturday, October 22, 2016. The exact coordinates for the first stop for the formal portion of the field trip are 35 degrees 12' North, 114 degrees 11' West. Maps showing starting points of the Fall Field can be downloaded here. Accommodations - Sandwiches, cookies, bottled water and sodas will be provided for lunch on Saturday and Sunday. Overnight accommodations and all other meals, including dinner on Saturday night and breakfast on Sunday morning in Kingman will be the responsibility of each participant. Contact info for motels and restaurants in the Kingman area. Level of Difficulty -The level of difficulty for the formal trip, starting at noon on Saturday, will be quite easy. All of the stops except for the last one on Sunday will be essentially road cuts or places where people only have to walk 50 yards on easy trails. The last stop on Sunday can involve some scrambling for more intrepid souls, but also is designed for those who only want to walk a few dozen yards or so. It will be a series of old mines right on the road with two examples of depositional contacts that are a bit harder (200-500m distance <50m climbing) to get to that I don't think everyone will want to do - at the same time there are plenty of things to look at right on the road. This will be a fairly long stop for those who want to do a little scrambling, and less so for those who are more challenged meaning that after 30 minutes to 40 minutes some people might just want to hit the road. Photo Caption: View to the west from Sitgreaves Pass on old Route 66 a few miles east of Oatman, Arizona of the Silver Creek Caldera. Gold Road Mine in the middle ground and main components of the caldera-fill depicted in solid colors in the upper view: intracaldera Peach Spring Tuff, Times Granite, and Moss Monzonite Porphyries. Field Trip Highlights - The main focus of the field trip is tracking the Peach Spring Tuff’s outflow sheet starting at its surrogate type locality in Kingman, through its source caldera near Oatman, Arizona, and across the Colorado River into a highly extended fragment of the caldera connected to well-known exposures of its outflow sheet in the Sacramento Mountains, California. The trip’s route will, in effect, mimic the strongly south-southwesterly extension vector Ferguson et al. (2013) and Ferguson and Howard (2014) have documented across the Colorado River Extensional Corridor. This direction differs significantly from the west-northwesterly direction proposed and supported by many others (eg. McQuarrie and Wernicke, 2005). The low-sulfidation quartz-calcite-adularia epithermal Gold Road vein along old Route 66 near Oatman will be the only stop on the main field trip that will involve mineralization and economic geology. See Map of Planned Fall Field Trip Stops. The purpose of the morning phase of the trip on Saturday, October 22nd is to examine new and old aspects of the Laramide McConnico mineral district southwest of Kingman, and an important outcrop of Peach Spring Tuff that is part of a controversy regarding how the Peach Spring Tuff was erupted; a recent paper that has received a great deal of global attention (Roche et al., 2016) suggests that the pyroclastic flow was slow-moving and that it may have been possible to “outrun it on a fast bicycle”. The presence of lithic blocks not from the caldera in the outcrop we will visit on Saturday morning challenges this interpretation. Stops on Sunday night near the campsite in the Sacramento Mountains and on Monday will focus on the geometry of the extended caldera fragment and the nature (unconformity versus detachment) of at least two gently dipping contacts near Eagle Peak and Flattop Mountain that have long been interpreted as detachment faults. An additional contact that had been interpreted as a detachment and then re-interpreted as an unconformity (Simpson et al., 1991) will be discussed and looked at from Eagle Wash Sunday evening on the way to the campsite, but is too hazardous to visit. Contact Info - If you have additional questions about the Fall Field Trip contact Charles Ferguson at (520) 444-8905 or at caf@email.arizona.edu. Ferguson C. A., McIntosh, W. C., and Miller, C. F., 2013, Silver Creek caldera - The tectonically dismembered source of the Peach Spring Tuff: Geology, v. 41, p. 3-6. Ferguson, C. A., and Howard, K. A., 2014, Early Miocene Silver Creek caldera as a strain marker in the Colorado River extensional corridor, USA: Geological Society of America Abstracts with Programs, v. 45, p. 608. McQuarrie, N., and Wernicke, B. P., 2005, An animated tectonic reconstruction of southwestern North America since 36 Ma: Geosphere, v. 1, p. 147-172: DOI: 10.1130/GES00016.1. Roche, O., Buesch, D. C., and Valentine, G. A., 2016, Slow-moving and dense pyroclastic flows during the Peach Spring super-eruption: Nature Comm., DOI: 10.1038/ncomms10890. Simpson, C., Schweitzer, J., and Howard, K. A., 1991, A reinterpretation of the timing, position, and significance of part of the Sacramento Mountains detachment fault, southeastern California: GSA Bulletin, v. 103, p. 751-761.